We are inviting the community to our Christmas Fundraising Fair this Sunday 25th November between 2-4.30 at Springhill Academy in Burntwood. We are hosting a wide array of shopping, craft and gift stalls and activities. Join us for an afternoon filled of fun for young and old alike with free entry. There will be games, crafts, entertainment, Christmas shopping, raffle, tombola, refreshments and a special visitor. Raffle prizes include a spa day for two, an overnight break in the Hilton hotel and £100 cash. 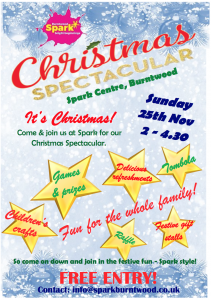 The money raised from the event will go to the Spark Centre in Burntwood which supports local families by providing groups, support and activities. We are a not-for-profit Community Interest Company not a charity so cannot claim Gift Aid on your donations.